I'm an unabashed fan of common goldenrod (a.k.a. Canada goldenrod) (Solidago canadensis L., family Asteraceae). Its flowers are an important late-season food source for pollinators drawing in a wide range of insects and their yellowish to gold-tone makes a nice photo backdrop. In fact, this native perennial offers a pollinator photo op paradise. To be fair, common goldenrod employs a combination of creeping underground rhizomes and chemical warfare (= allelopathy) to spread aggressively and form dense "colonies" in unappreciated locations. Water-soluble leachates from the plants suppress seed germination and growth of a wide range of herbaceous plants as well as some trees such as sugar maple (see "More Information" below). Keep in mind that allelopathic activity extends to all members of the Solidago genus meaning that they may not play well with others. However, other members of the aster family may be the exception. I've noticed that another of my favorites, New England aster (Symphyotrichum novae-angliae), is a frequent companion to common goldenrod. You do not need to settle for common goldenrod to enjoy goldenrods in your landscape. Many Solidago species and their selections are much better behaved. A few that have gained popularity among gardeners in Ohio are S. sphacelata 'Golden Fleece', S. rugosa 'Fireworks', and S. flexicaulis 'Variegata'. Of course, keep in mind possible allelopathic activity if you plant goldenrods among other plants. The rise in popularity of goldenrods in landscapes and naturalized areas is nothing to sneeze at, literally. Part of the new appeal is the general awareness that goldenrods are not a threat to hay fever sufferers. Usually, common goldenrod blooms at about the same time as two other members of the aster family: common ragweed (Ambrosia artemisiifolia L.) and giant ragweed (Ambrosia trifida L.). The abundant, windblown pollen produced by the small, muted male flowers of the ragweeds is considered by the medical community to be a primary contributor to late-season hay fever. 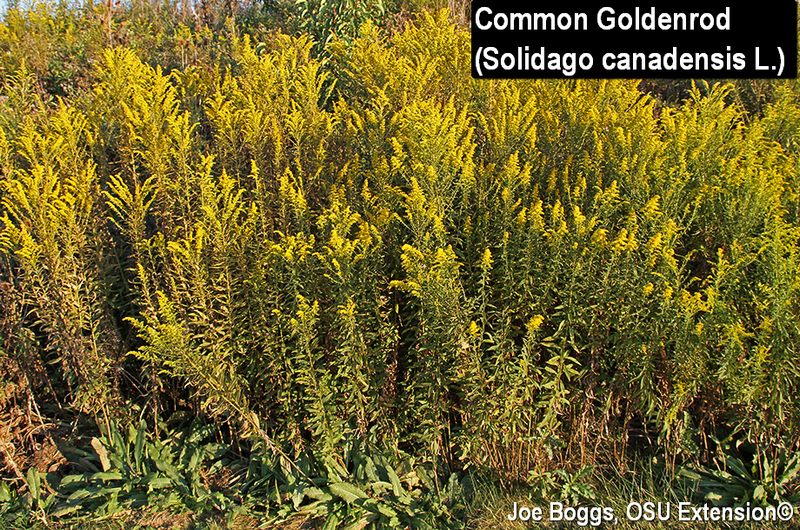 Unfortunately, common goldenrod with its flashy, golden-yellow flowers often got the hay fever blame. Indeed, late-season hay fever was once commonly called "goldenrod fever." However, goldenrod produces large, sticky pollen granules that are designed to be moved around by pollinators; the pollen is not blown about in the wind. On a side note, the "L" after the scientific names for common goldenrod as well as the ragweeds signifies that these plants were originally described by the noted Swedish botanist, Carl Linnaeus. No doubt hay fever sufferers have long pondered why he chose Ambrosia for the ragweed genus which is Greek for "food and drink of the gods" … what was he thinking? Perhaps Linnaeus also describe Cannabis sativa L.? Well, yes; but that's another weed story.